The process starts with an exchange of ideas and information. 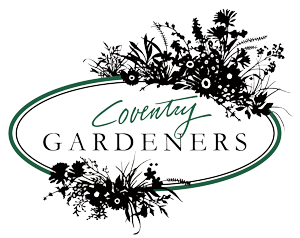 As you walk around your property, a Coventry Gardeners designer will work closely with you to create a design–one that not only looks good on paper, but will also flourish in our climate and the growing conditions of your site. Our design services include a booklet about your new garden with a plan view of the design, color pictures of the flowers, and maintenance tips. To see a full range of gardens we have designed, please visit our Portfolio. Soil preparation is fundamental to the success of a healthy garden. To improve drainage and promote deep root growth, we start by rototilling to break up the clay. Next, texture and fertility of the soil is improved by mixing in compost and adding organic fertilizer. At this point, the soil will crumble between your fingers and is ready for planting. The plants are laid out according to the design drawing and planted. A layer of shredded hardwood mulch helps control weeds, conserves soil moisture and completes the look of the garden. We have two maintenance plan categories to choose from – Comprehensive Maintenance Plans and Seasonal Visits. Select the plan that fits your needs best from the options. Of course, the most important maintenance factor for a beautiful garden is proper watering. Routine watering is not included in our maintenance plans, it will be your responsibility to water the garden. Our 10 and 16 Visit Maintenance Plans cover all aspects of caring for your perennial garden except watering, which is the client’s responsibility. You can enjoy the beauty of your garden and relax knowing that it is well-tended regardless of your schedule. The difference between the two plans is the number of summer visits. The 16 Visit Plan includes weekly summer visits. The 10 Visit Plan includes visits every other week through the summer. For the first season, new gardens are on the 16 Visit Plan, so that our gardeners can keep a close eye on the plants until the garden is established. The 16 Visit Plan is a good choice for the ongoing care of large gardens. After the first year, the 10 Visit Plan may be an option for small to medium gardens. This plan is a more casual approach to gardening. The garden will be less tidy at times due to the longer interval between summer visits. Our seasonal visit options give you a helping hand in the garden. We will come out 2, 3 or 4 times throughout the season. You do the routine maintenance between these visits–perfect for the avid gardener!